I’ve long been known by my friends and family as “not overly crazy on most days,” but several weekends ago a friend and I went completely insane. We drove From Salt Lake City to Minneapolis. Yep. We both wanted to go to Minneapolis for a dance event and plane tickets were too expensive. We looked into taking a Greyhound bus, but that was also more than we wanted to spend. So we found a cheaper option: rent a car that gets really good gas mileage and drive ourselves! It took us about 22 hours each way. 20 hours of driving and a few hours for sleeping and rest stops. You’d think that a road trip like that would go pretty quickly, listening to audio books and fun stuff like that. But we didn’t take any audio books with us. All we had was jazz music, which I admit is pretty awesome. I like jazz music, but still… after that long it would have been nice to have listened to something else. I’m just glad it wasn’t country music. I remember a road trip I took with some friends a few years ago down to San Diego for spring break. We went hiking, went to Tijuana, visited the San Diego Mormon Battalion Historic Site, did other touristy stuff, and I’m not sure what else anymore. The hike we took was supposed to be a super easy hike (more commonly called “a walk”) on a wide trail. We somehow got off the trail very early on and took what was probably the hardest path to where we were going. It was awesome though. On the way down from the hike we took the easy way. I was glad we took the hard way on the way up. It would have been sort of anti-climatic to have reached the water fall after so little effort. As it happened, it felt really good to have worked hard for the reward of the fresh cool water and then have an easy walk back. On the drive back from San Diego I remember driving along when one of my friends put on some country music. I all of the sudden felt really tired. I felt I wouldn’t last very much longer behind the wheel. I asked my friend to change the music and I was immediately refreshed. So the point of that was to say that had we listened to country music on the way to Minneapolis I might have fallen asleep and wrecked the car. Now, for those of you now ready to email me and tell me that country music is good music because of the wonderful lyrics and all that, I know. I’m not saying it’s bad music. I believe that it’s mostly good (wholesome) music. It’s just not what I like. And to prove that country music isn’t always a bad thing for me, as a result of thinking about country music I got to relive a fun road trip to San Diego. I hadn’t thought about that for a while. I’m pretty sure I had my camera with me nearly the entire time I was on the road trip to and from Minneapolis and while there. I only managed, however, to take 4 or 5 photos. All of the photos were of the same thing: a beautiful sunrise. 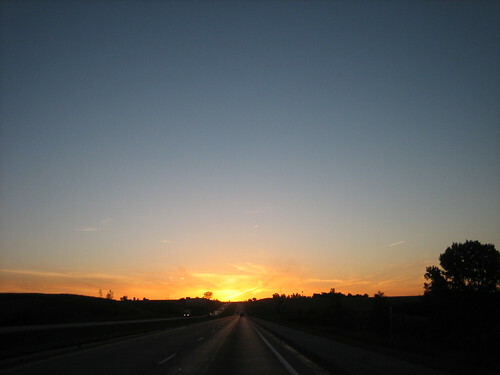 This was taken Friday morning while driving East on I-80 near Shelby, Iowa. We started our drive on Thursday afternoon around 2 or 3 PM MST and arrived in Minneapolis around 12 PM CST on Friday. We found a good deal on a hotel room via Expedia and slept for several hours. And then we went dancing and danced an awful lot despite still being tired. On the trip back we had another friend drive with us. She’d been on a road trip for the previous 9 or 10 weeks and had wrecked her car in New York. So instead of flying home she flew to Minneapolis, danced the weekend away, and then drove back to Salt Lake City with us. One last thing. I’m certainly no world traveler. I haven’t even been to that many of the states in the USA. Everywhere I go I always go to mormon.org and find a church to attend in the area. Out of all the places I’ve been (which again, isn’t that many) I don’t remember ever finding friendlier people than those that I met in Minneapolis. Both my friend (the girl who drove back to SLC with me and the other guy) and I were impressed by how nice everyone was. Going to church away from home is always fun. It’s like going home while away from home. There’s nothing better than friendly people in a wonderful environment. Also, I don’t have to worry about missing lessons since in the LDS church the lessons are the same no matter where you go. Every congregation follows the same lesson manuals. Oh! I also saw the collapsed bridge while there. I was driving down the freeway when I started seeing a bunch of “freeway closed” signs. I thought it was weird that the entire freeway was closed. As I tried to get around what I thought was just construction I saw what it actually was. It was quite humbling to actually see it. You see a lot of things on the news that are far away from home, and while you still know they are real, they seem distant and it’s hard to feel it like you probably should. I don’t want to say it was nice to see it. That just seems weird considering what happened, but it was humbling anyway. See more videos of the event on YouTube. Cool dancing! I really liked watching The Silver Shadows. I think he’d be interested in knowing that it also helps you sleep. haha that was awesome! Thanks for the link. Another thing that drives me mad about country music is that when I tell people I swing dance they say “oh I do country swing,” as if it were even remotely similar. There’s probably real country swing which is a legitimate dance, but 99 people out of 100 who claim to do “country swing” don’t do do anything except stuff like the pretzel. Then, they stop dancing and lift the girl in the air. Then put her down and resume the other stuff.